One Art Space presents Dream EverStanding an exhibition commemorating the legacy of Dr. Martin Luther King, Jr.
Oriel Ceballos, Sophocles, Christian Frederick, Alexander Pereyra, Alina Tejacla, Azim Thomas, Chunbum Park, Jack Florczyk, Jamar Fajardo, Lubay Antoine, Melonie Knight, Shelby Jaquez, Will Porter. Sophocles, Nicole Thomas, Eric Chifunda, Oriel Ceballos, Michelle Sakhai, Will Porter. 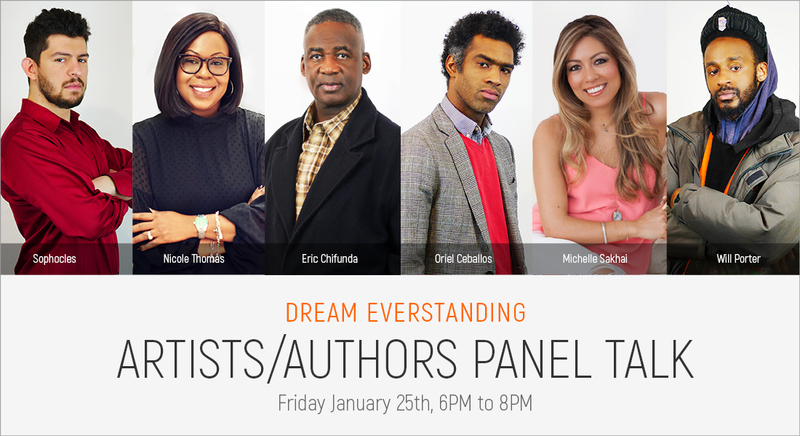 All are invited to attend our panel talk with incredible authors this Friday, Jan 25, 2019, from 6 PM-8 PM. Come to listen to authors who will discuss their books, respond to questions, and share what inspires them. There will also be a light reception with food and drinks for guests to enjoy, as they listen to the panel and purchase signed, personalized books from authors. Oriel is a contemporary artist, curator, and educator. He is a self-taught artist and did not think of becoming an artist until age 29. Oriel’s technique involves sketching and painting in a semi-realism style mixed with expressionist and impressionist elements. He also employs bright colors, text, symbolic references, and a childlike painting style which leaves negative (white) spaces in his artwork. His art invokes cultural, philosophical, and historical themes to foster critical thinking and humanistic ideals. Through his art, Oriel hopes to engender a critical understanding of art, culture, and politics. Oriel exhibited his art in over 30 group exhibitions; he has illustrated a book and music album cover; has been featured in several short documentaries; interviewed over a dozen times by journalists, and has sold thousands of paintings as a curator and street artist. Sophocles is a published author, illustrator, cartoonist, fine artist, curator and art teacher. makes what he calls Metro Manga (Subway Comics) every time he rides the subway. On his portable drawing pad, Sophocles captures portraits of real New Yorkers as they commute and makes up fictional Subway Stories to go along with them. He uses a Fude Pen (calligraphy brush pen) to draw comics on white paper and a Uniball Signo white pen to draw manga on black paper. In October 2018 Sophocles took his Metro Manga to the next level by making acrylic paintings on canvas. He self-published his books Subway Stories and Sounds of the Subway. He has taught art classes in afterschool programs in NYC and currently teaches cartooning and manga (comics) in Manhattan. He has curated shows in Astoria, Queens and Dumbo, Brooklyn, making Dream EverStanding his 15th group exhibition that he has curated. The curator Christian is based in the Tristate area. His work for the past 20 years has used different aspects of art history, which have an undeniable impact on our contemporary Art & Money culture today. In the current climate where many believe art history has no relevance to financial challenges, as an artist, he finds himself continually returning to those aspects that are often hidden or misrepresented in the “official” recordings for posterity. By mixing Money and Art and diverse approaches to making art; installations; public, curatorial and web projects, the context of the work has an impact on the work’s relationship to the viewer.